Deck of 1000 Spreads: I Need Advice! CountryMouse created this "I Need Advice" spread to get advice about a situation. 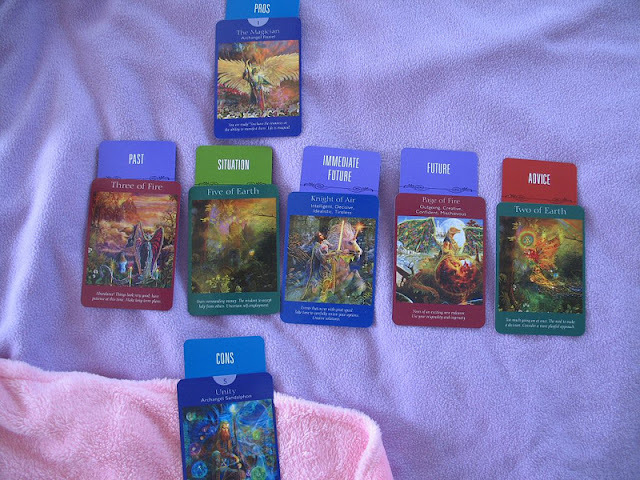 She used the Angels Tarot along with it. This simple, but eloquent spread is a good example of how the Deck of 1000 Spreads simplifies things. Unless you keep a list of spread positions handy, creating spreads the "old way" meant using the spread positions that came into your head or occurred to you in the moment. Silly as it sounds, I could see creating an advice spread without thinking of "pros and cons" as spread positions, you know what I mean? Or maybe not have two cards speaking to the future, which is brilliant, because things might look good at first and deteriorate as time goes on, or visa versa. And you'd want to know that. When you're in the moment of creating a spread the old way, you're limited to the positions that occur to you in that moment. But the Deck of 1000 Spreads gives you 59 of the most common spread positions to choose from, making it fast and easy to create a spread that speaks precisely to the challenge you're trying to solve.